Floor Space: 225 Sq. Ft. Suitable for 6 to live in and up to 10 to sleep in. Features: Flame, water, wind & mildew resistant. Stove Pipe Jack. Two zip-up doors with insect screens, Two Windows, Upper ventilation sleeves. 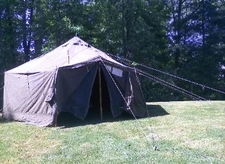 Tent Includes: Poles, Ropes & Rope Slips, Guy Stakes, Carry Cover. Shipping calculator on shopping cart.